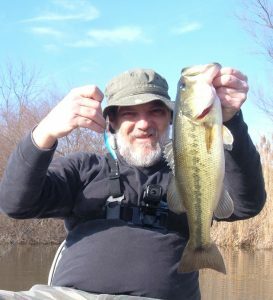 When I caught a few bass back on November 4, I accomplished my annual goal with bookend bass spanning March to November. Thus, I was content to put away my gear and call it another successful year on the water for 2017. However, Mother Nature threw a welcome wrench into that plan with 50 degree temperatures to kick off December. Fortunately, I was able to find time to get away, looking for one more bite. A favorite bit of breakfast fuel, tasty but need to re-think my intake as the previous pic of my catch shows a substantial increase in the gut below the GoPro, sounds like resolution time. Super Sonic Combo – There’s a Sonic Drive-In just a few blocks from home and it’s right on my route to the fishing hole. 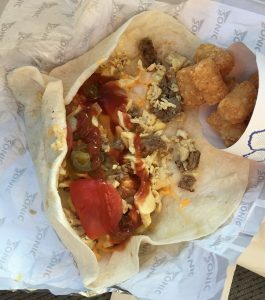 I dig their Super Sonic burrito as it provides a great way to kick off my morning with a jalapeno punch. Problem is, it doesn’t open until 6:00am and I’m usually well on my way to the water by then. But when you get a chance to fish in December, you also get a chance to sleep in a bit to let the sun rise and its rays do whatever they can to warm the mood of the bass. December Flashback – The only December bass I had on record prior to this trip came from an old favorite spot that we called Emstrom’s Pond. 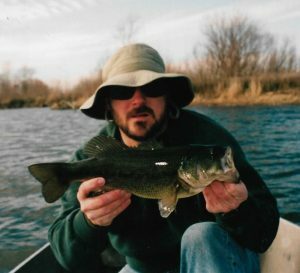 The three bass in the log were caught on three trips during the first week of December 2001. All came on a black and blue jig and pig on a classic piece of structure, The Beaver Lodge. I’m sure there have been a few reasonable December days in the interim but I’ve just never pulled the trigger. This year I figured that it was high time to just do it instead of only thinking about it and later wishing I’d given it a go. 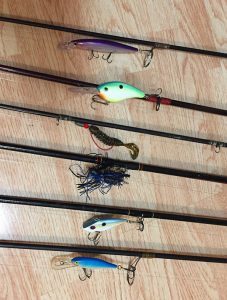 Winning Lure – I had a total of three bites and all were on the Rapala Shad Rap. One came before my catch and another came after but both of those managed to get loose shortly after the hookset. It never ceases to amaze how a bass can elude those treble hooks but it happens. What was also fun about the Shad Rap coming through is the fact this particular lure is well over 20 years old as evidenced by the stouter, replacement treble hooks that I used to put on many of my crankbaits back in the day. 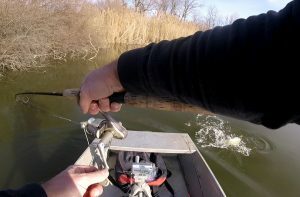 GoPro – I got this catch on video like a number of others this year and have included the snip above from the footage. I’m not quite sure what lies in store for my clips but have contemplated working them into some future blog and Facebook postings. Whatever the case, it has been a fun addition to the fishing experience that I hope to expand upon for 2018.